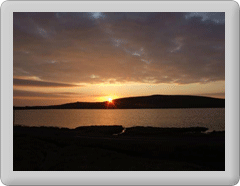 Although there are relatively few visitor accommodation establishments in Fetlar, you can still choose between self catering, bed and breakfast, bod or caravanning and camping. You can find out more about each option below. As of May 2018 a new self catering cottage is almost ready for occupation. Details of this will be published here as soon as they become available. The Lodge, which has recently been renovated to a high standard, offers self catering accommodation in a prime Fetlar location with amazing sea views.